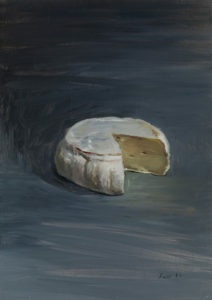 Christian Furr, based in London, has painted the humble cheese for over a decade. 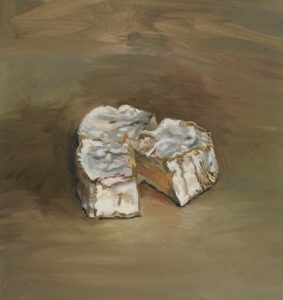 The cheese has become his metaphor for simplicity, purity and artisan dedication; all of which are attributes the artist associates with his own oil painting practice. There is even a colour available to artists named 'Furr Brown'. 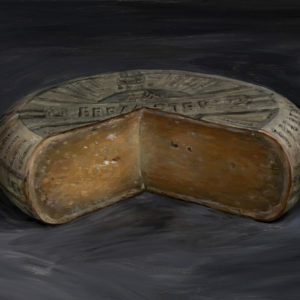 The smell of a ripe, rare cheese is not an easy thing to convey through the medium of paint, however Furr has managed not only to achieve this, but to highlight the individuality of each of the noble cheese family. The texture, ripeness and individual colour of each cheese is rendered in deft strokes and washes, leaving us in no doubt as to the nature and flavour of this cheese. Furr focuses on keeping oil paint a fresh, living medium, through experimentation and the exploration of new concepts. Christian examines everyday objects in search for the objects essential nature, be it a flower, a milk bottle or a measure of cheese. As a consummate paint-handler, Christian’s influences are remarkably diverse. His inspiration may come from a fragment of Rumi poetry or a lyric from The Doors. The symbols of his far-reaching interests find their way into his work, sometimes overtly, sometimes discretely. 'On the window ledge in front of the beautiful decaying Georgian wallpaper, a half bottle of milk had gone off, so I decided to paint it. 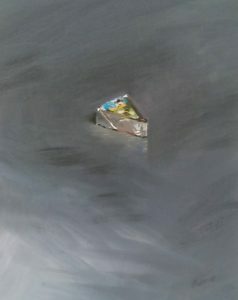 As I painted, I mused on the origin of cheese. Why not paint cheese? 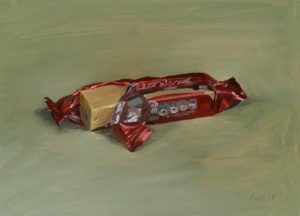 Cheese is not often painted. 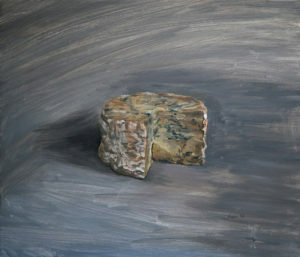 I decided to paint the artisan cheeses of Great Britain & France. 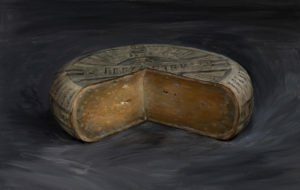 The textural quality of the cheese can be portrayed beautifully with thick, creamy impasto oil paint. A good cheese is a pleasure to look at. If its a soft one and begins to melt, it will force me to work quickly to capture the moment. I wanted these simple cheeses to capture the breadth of human experience and emotion. Each cheese has it's individual skin, veins and aroma. This was a peasant's staple diet for 500 years ago, a portable and long lasting source of energy. When I paint a cheese I research it and get to know it. 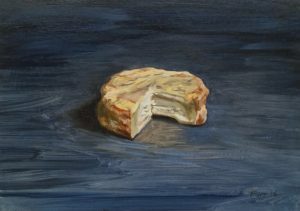 I was painting 'Chabichou' the other day, it's a great cheese, it looks beautiful and tastes even better. 'Chabichou' from Poitier dates back to AD 732, the time of the defeat of the Arabs. The cheese was later named cheblis ('goat' in Arabic), which would become 'chabichou' thereafter. I have discovered that Napoleon's favourite cheese was called 'Epoisse'. He would eat it with a bottle of Gevrey Chambertin - this cheese is one of the smelliest cheeses known to man. I am not interested in their smell so much as their strange beauty.